I talked with Carl Mattson, Montana grain grower and an agricultural policy and conservation consultant, about why he made the switch to no-till, why he was an early adopter of the practice, why so many farmers in his region use no-till, and what he sees as other obstacles to the future of sustainable farming. The crew at Mattson Farms. Can you tell me about your operation and your farming history? I work today on Mattson Farms, the same farm that I grew up on as a kid. 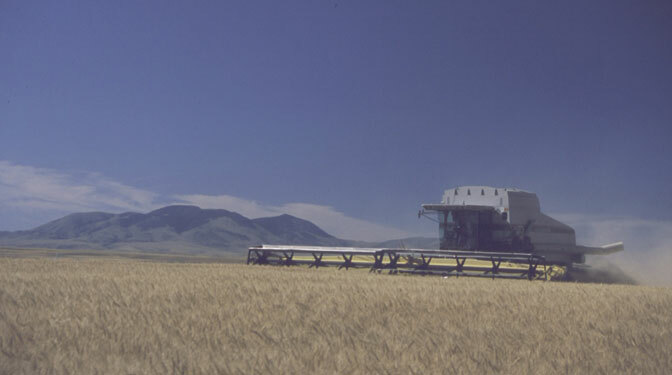 I left for college at Montana State University but then started farming again in 1973. 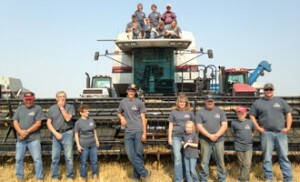 My wife, Janice, and I grow wheat, peas, and lentils, but we’re primarily a wheat operation. We grow hard red winter and hard red spring wheat, but we will be introducing lentils into our operation this spring. We’re farming in a very arid area and our biggest issue is water conservation. We can buy seed and fertilizer but we can’t buy water. Lentils work well in this region because they don’t draw a lot of moisture out of the soil profile. How did you first get engaged in conservation measures? Several decades ago, neighbors starting taking parts of their lands out of production to create grasslands and important habitat for species. 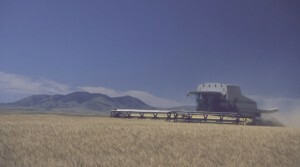 It was part of the U.S. Department of Agriculture’s Conservation Reserve Program. But in the process of taking this land out of production there was an unforeseen consequence – the weeds arrived before the grasses did, so they blew over into our fields and pulverized the soil. We had a lot of erosion. That’s when I started going to no-till conferences to learn more about the practice, and I officially switched my operation to no-till in 1993. We did it primarily for soil conservation purposes but now we’re doing it for water conservation, too. I had worked on the USDA’s Natural Resources Conservation Service technical committee for years and I was aware of what conservation measures were being tested across the country. I saw the benefit of these practices and especially no-till. That’s why I adopted them on my operation as fast as I could throughout the 90s. Were you hesitant to make a sweeping change to your operation? I spent a few years researching no till, so I was well prepared and knew what to expect. But when we finally made the switch, we were worried about losing production in the process of switching from one system to another. No one wants to go backwards, but the good news is, we absolutely went forwards. There were just a couple of producers playing with no till in the early 90s, but it’s now common practice. Ninety percent of the farms in my area are now no till. I’m proud that we were early adopters of the technology. What other technologies have you used to protect your soil and yields? We have worked with variable rate fertilizing and seeding practices for many years, but the precision agriculture technique that I’ve utilized the most is guidance, such as GPS that helps us in our planting and harvesting operation – it saves us from costly overlapping, from applying fertilizer twice. It provides significant environmental benefits. We’re also constantly in the process of collecting our own data to analyze our farm’s operation and efficiency. What barriers do you see for the future of sustainable farming? The issue of farm transitions from one generation to the next doesn’t get a lot of attention – but it’s a big issue and one I worry about. I’m almost 65 and my wife and I want to transition the farm to our son and daughter who are both at home and working on the farm. Financially, it’s very burdensome to make the transition given the need for tax counsel, attorneys – you shouldn’t just do it on your own without any guidance. You also need to plan ahead – you can’t just think about transition when the older generation gets sick. We’ve been working on our transition plan for 10 years. If you wait too long, you can’t get it all done in the timeframe. And in some cases, you might have to sell the farm in order to inherit it. 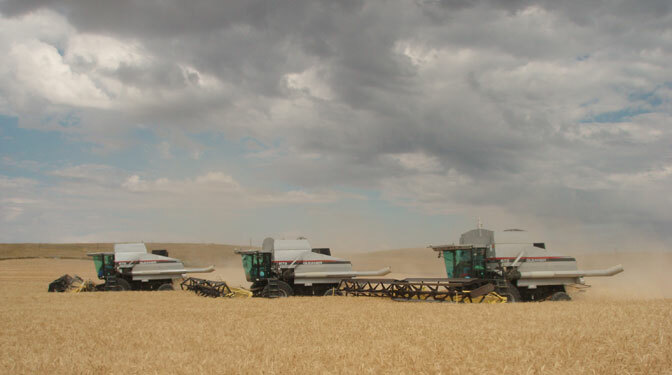 It’s not an easy fix – but most of the trade organizations like Farm Bureau, Farmers Union, and the National Association of Wheat Growers can advise growers on the tax implications and passing a farm on to the next generation. This entry was posted in Climate Resilience, ecosystems, fertilizer, Sustainable Agriculture, Wildlife Protection and tagged agriculture, conservation, conservation tillage, cover crops, drought, environmental defense fund, farmers, farming, farms, fertilizer, food production, food security, no-till, NRCS, nutrient efficiency, soil health, stewardship, sustainability, sustainable agriculture, USDA, wheat. Bookmark the permalink. Both comments and trackbacks are currently closed.